I've been following the famous motivational guru, Tony Robbins' books since his Awaken The Giant Within (1991). So, I can consider myself a fan of his book. In the recent years, his books are mainly focusing on the personal finance, from the 2014's Money - Master The Game to this year's Unshakeable - Your Financial Freedom Playbook. 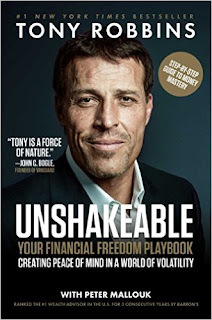 Effectively, Unshakeable is a follow-up to his much voluminous Money - Master The Game (2014), there are quite a number of Rules/Principles stated in Unshakeable are actually a conscious version from Money. Of course, the overall context of the book is more applicable to US e.g. you will see him stating quite a number of investment vehicles which are for US citizens, like their 401(K) plan etc.. Having said that, I still enjoyed reading it very much as all the Principles/Guides are deemed universal and timeless. Some of you might find that most (if not all) of his principles are kind of common sense and too simplicity and he himself admitted it. Anyway, who says life need to be so complicated? Most of the time, the difference between those who are succeeded and those who are not comes down to this word : ACTION. I especially like Section III of the book whereby it covers the Psychology of Wealth. Many of the proven biases (like "confirmation bias", "recency bias" and "home bias" etc..) are covered here and he also provided the solution(s) to counteract these biases. Also, his points on the "Art Of Fulfillment" and the Two States of self ("Beautiful State" vs "Suffering State") are something that I adored too. Overall, I do recommend this book to everyone who want to up your ante in the personal finance acumen. "Money doesn't change people. It just magnifies who they already are"
A picture tells a thousand words. The cover page photo used for Tony Robbins showed a man who has been through lots of hardships in life. You may disagree with me. Karen : Yup, agreed! If you've read some of his book/biography, he has a tough growing-up phase and also carrying some serious medical condition.. So, must give it to him for his success now.